There’s nothing like going to visit Mimi and Papi! When I tell my kids I’m taking them to their grandparents house, they whoop and jump around as if I’ve just told them I’m taking them to Disney World. Grandchildren have a special bond with grandparents that is unique from the parent/child relationship. My two young boys are lucky to be growing up with their Mimi and Papi living only two miles away. Since the day each of my sons were born, their grandparents have been a huge part of their lives. They are there for the big moments–holidays, birthday parties, and soccer games. As well as the small moments–learning a new game, trying a new food, or kissing a boo boo to make it feel better. I know one day my sons will look back on their childhood and realize how much their grandparents influenced the men they became. As uncomfortable as it is to say… grandparents won’t be around forever. 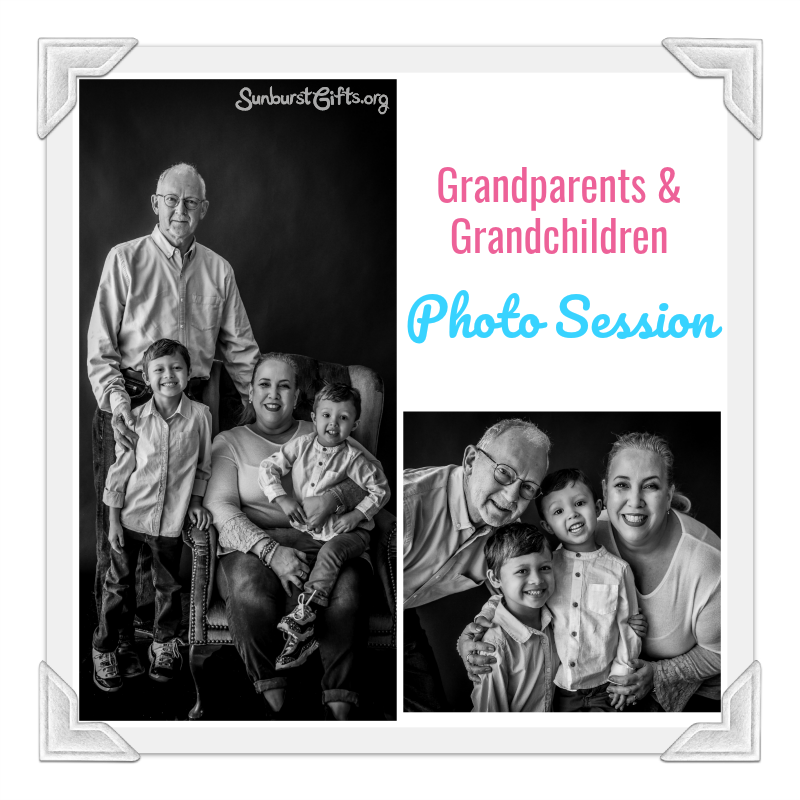 Before time slips away from us, I wanted to capture this moment in their lives so my husband and I gave his parents the gift of a Grandparents & Grandchildren Photo Session. Mimi, Papi, and my two sons had a photo shoot just for them! Look at these precious moments so artfully captured! We will treasure these keepsakes forever. Is it macarons or macaroons? I found out recently there IS a difference between the two besides the spelling. A macaroon is coconut based. 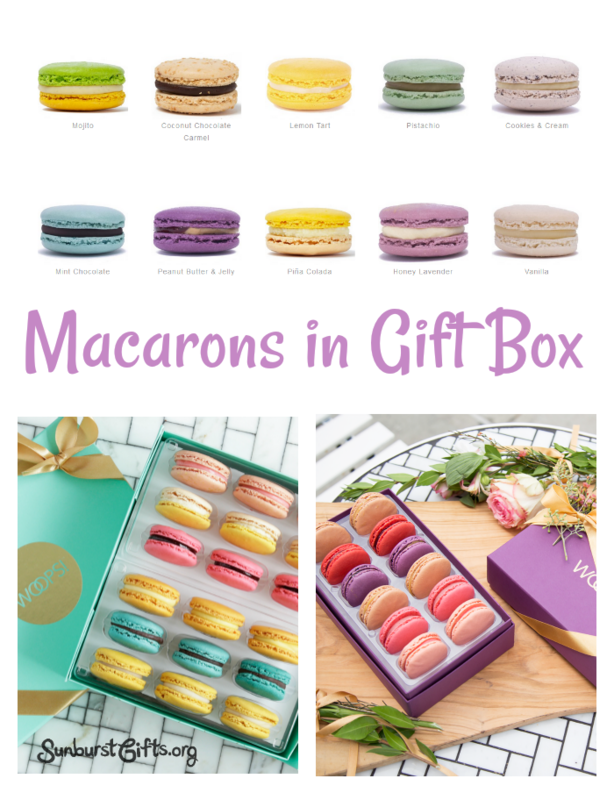 For this gift idea, I’m referring to macarons, which are meringue based and come in a wide range of colors and flavors. 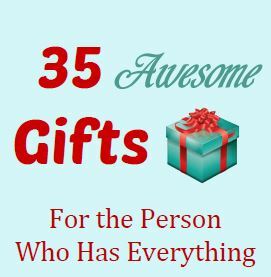 There are SO many colors and flavors to choose from which makes it fun to give someone a variety! If you’ve never had a macaron, it’s a delicate cookie with two thin crusts and a filling made of either ganache, buttercream or fruit jam. It’s also full of contrasts. A macaron packs huge flavor into a tiny baked goodie, and it’s somehow both rich and light at the same time. They come in delicious flavors such as mint chocolate, cookies and cream, mojito, honey lavender, lemon tart, and piña colada. Is your mouth watering yet? Because I’m just scratching the surface on the different types of macaron flavors out there. We all know people who are gems because they brighten our lives like a sparkling diamond. Have you let them know lately how much they mean to you? 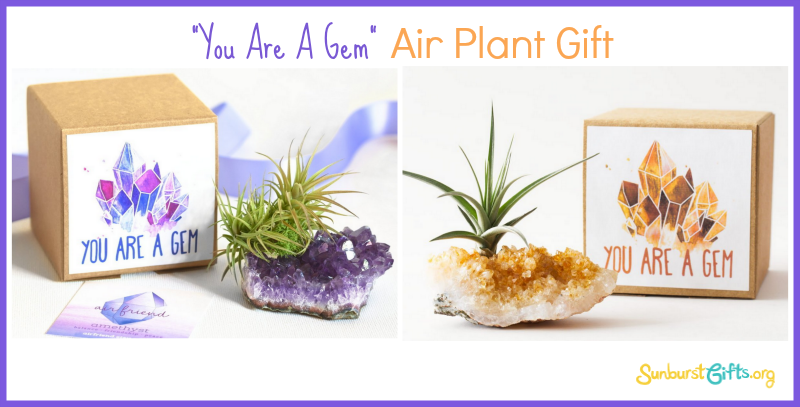 This Air Plant Gift tells them “You Are a Gem” with words and a gift. Air plants get the majority of their nutrients from the air. That means they are extremely low-maintenance and easy to keep alive! They will last for years. Air plants are also attractive and come in interesting shapes and textures. Maggie Louise Confections has reinvented the box of chocolates with color, personality and unique customization. Each box has fun bite-size chocolates to celebrate everyday indulgence. 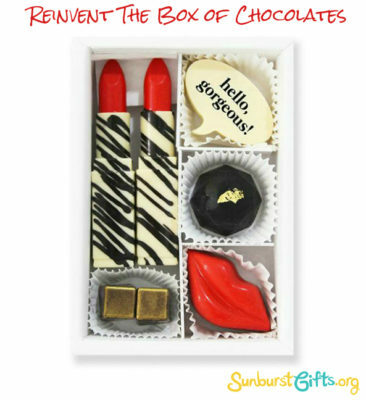 The gourmet chocolate gift boxes and luxury confections are chocolate look-a-like creations of lipsticks, lips, jewels, precious stones, coffee cups, snowmen, mittens and the list goes on and on. When I think of a hammock, three things come to mind–rest, relaxation and sleep. With a portable hammock, you can enjoy those three things wherever you go! Did you know the best hammocks are no longer made of rope? They’re made of parachute nylon which makes them extremely soft and comfortable. It’s like sleeping in a cloud because the hammock stretches and conforms to your body. The nylon material is also what makes them lightweight and portable, allowing them to pack down to a very compact size. 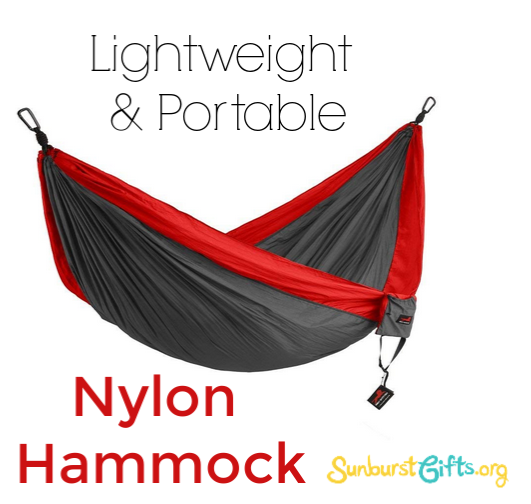 A person doesn’t even have to roll or fold–simply shove the hammock back into the attached, small stuff sack. In the stuff sack, a two-person hammock packs down to 6 inches X 9 inches. So small! I love handmade gifts. I remember watching my mother create beautiful gifts from vintage jewelry. 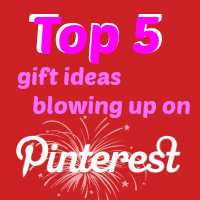 My mother and I would also help each other handcraft unique gift ideas waaay before Etsy ever came along. 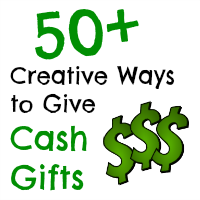 Mom would have loved Etsy.com where you can shop for anything made by creative people everywhere and where she could have shared her gifts too! When an Etsy email pops up, I’m always curious to see who created what. Oh my… what a find this time. Butterflies! They are exquisite! Wild and Free Jewelry created by Corina Alulquoy Brown are inspired by the ocean, wildlife, and Native American culture. 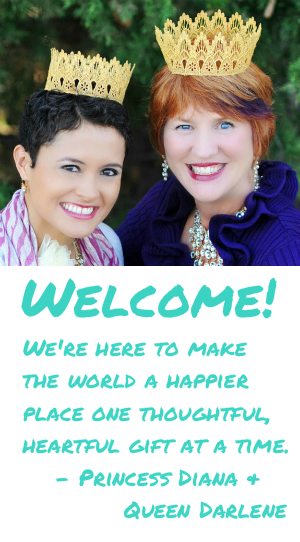 You have to look at her website! 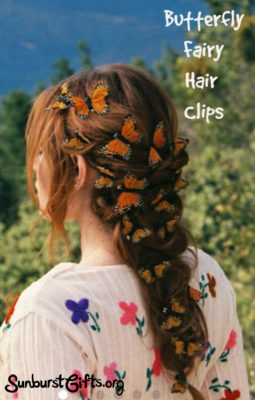 My favorites are the beautifully handcrafted butterfly hair clips by Corina. I have a confession. I tell my husband NOT to buy me flowers. Flowering plants are arranged beautifully in this moss covered basket. There’s nothing wrong with me. 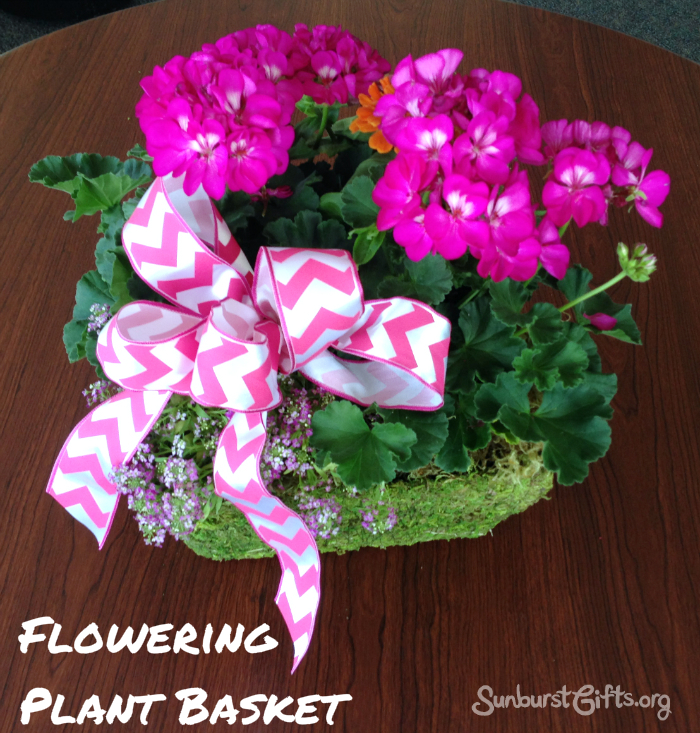 I love flowers – just not the expensive type that comes in a vase and dies a few days later. I’ve experienced the thrill of receiving a dozen roses or a spectacular flower arrangement, and I’m good. I treasure those memories, but I don’t need to experience them again. I tell my husband I’d rather take the money he would have spent on flowers and go shopping with it. Yes, I’ve become practical like that. In other words, flowers? No thank you. Instead, show me the money, honey! Let me add, I’m not alone in this. Several of the ladies in my office agree with me and have told their husband the same thing. “I love flies landing on my food,” said No One Ever! 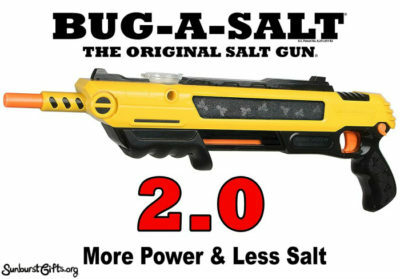 The Bug-A-Salt is a pump action gun that shoots a shotgun spray of ordinary table salt to decimate flies on contact. Did you catch the play on words? A-Salt. Assault. Love it! No more backyard BBQs with yucky flies buzzing around! I’m on summer vacation and reposting a favorite by our readers. Speaking of summer, it’s a great time for family photos! It’s not an easy task to get three generations of one family scheduled on the same date and time for professional photos. Life just seems to get in the way. That’s even more reason to pause and take the time to pose for those precious photos. Most people have nice cameras and even smartphones take excellent pictures, but professional photos should not be overlooked. 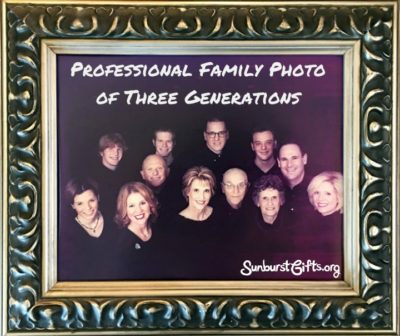 For my mother-in-law’s 80th birthday gift, the family decided we would have a professional photo of three generations of our family made. A photo of three or even two generations of family is a keepsake many family members will cherish. My grandmother knitted throughout her lifetime. She tried to teach me, but I never really showed much interest. Oh, how I wished I had learned because you never know when old skills can turn into new talent. This past Mother’s Day weekend, my husband, Randy, and I attended an arts festival in our community. Over the years, we have purchased art, prints, pottery, jewelry and leather goods at this event. Since we no longer need stuff to hang on the walls or decorate shelves, I’ve become interested in jewelry made by artists. Randy likes to look for unusual artistic designs on leather belts. Arts festivals are wonderful places to have the opportunity to speak with artists face-to-face. To me, this makes the art more personal. I’m always on the lookout for jewelry that is different when I spotted a booth by artist Susan Baile of Spiritus Designs. Well… that really piqued my interest! She went on to say she started knitting at the age of 11. When Susan retired, she wanted to do something to keep her busy. 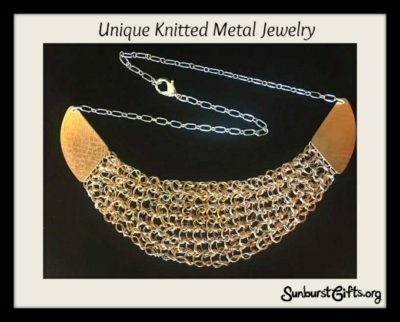 Since she loved to knit, she found a way to knit metals into jewelry.